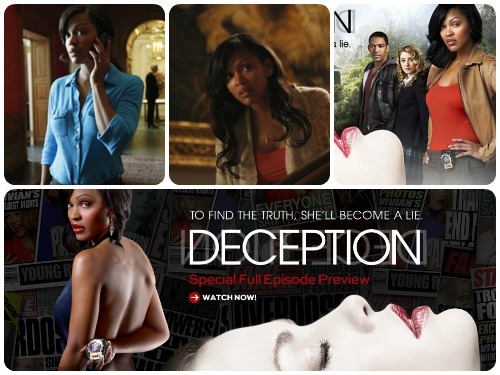 Are you watching Deception? If so, then you need to start spreading the word. The show starring actress Meagan Good is suffering from very low ratings that may place the show in jeopardy of being canceled. I will admit I am an avid watcher of the show. It started a little slow for me, but it has definitely picked up. The story is starting to evolve and I’m actually enjoying it quite a bit. Many people want to compare it to Scandal, but the truth of the matter is this show has nothing in common with Scandal outside of the fact that both of the leads are portrayed by black women. That is where the similarities stop. Deception stands on its own as a pretty well scripted show. It’s very soapy, but most of the popular dramas on television are i.e. Revenge. In my opinion, it’s better than any reality show or scripted drivel that appears on VH1 and BET. We’re always complaining about the fact that we don’t have more shows starring us on television. Well this is a pretty good show and it deserves a chance. If you haven’t watched it, I implore you to give it a chance. It airs Mondays at 10pm EST on NBC. I watch the show. I am curious how this one story carries an entire series. I do not think that people compare it to Scandal because of the storyline, but I think that with Scandal grips the viewer and the suspense is crazy. I do not think Deception draws the viewer in in the same fashion. I watch Deception and want the show to do well for Laz and Meagan's sake. I actually think Laz and Meagan do very well, but the supporting cast...yeah very soap opera-esque. I think Shonda Rhimes has set the bar very high that other networks have to bring it if they want a similar following. Thanks, I will watch this coming Monday.